Our second stay at Coconut Grove Apartments was just as amazing as our first. Once again we had a Terrace apartment with our own pool and spa. The apartment is well equipped, furnished beautifully and is in the perfect place to relax and soak up the beautiful tropical weather. It is in a perfect location on Macrossan Street - so close to Four Mile Beach and right next to the restaurants, cafes and shops. We will definitely stay here again! This apartment was simply incredible. We were ready to move in. Spacious, clean, and inviting. The location is simply perfect; right on the main street (Macrossan). Great restaurant (2 Fish) in the building, as well as shopping. I have stayed at Coconut Grove multiple times and I have never been disappointed. Coconut Grove has gorgeous surroundings and is very close to lots of restaurants and shops. The general vibe of Coconut Grove is lovely and relaxing. They have a great pool, with a spa and the waterfall is very relaxing next to the pool. The rooms are great! They are a good size and have balconies with a spectacular view! Honestly could not fault Coconut Grove. We very much enjoyed our stay at the Coconut Grove Apartments when traveling Australia. We had just stayed on an overnight boat on the Great Barrier Reef and that was fun. But when we arrived at the Apartments in Port Douglas it was wonderful. The room had 3 bedrooms and was so well appointed. Everything was so modern and new. We relaxed and were able to clean all our clothes and get some much need rest. This was a real highlight to our trip. We have stayed in a lot of hotels and timeshares--This one is on the top of our list! We were fortunate to stay in one of the top level (4th floor) apartments. Highly maintained with very good amenities and very professional plus knowledgeable staff. Stayed in 1 bedroom penthouse. Fantastic spacious apartment with all the facilities that you could require during your stay. 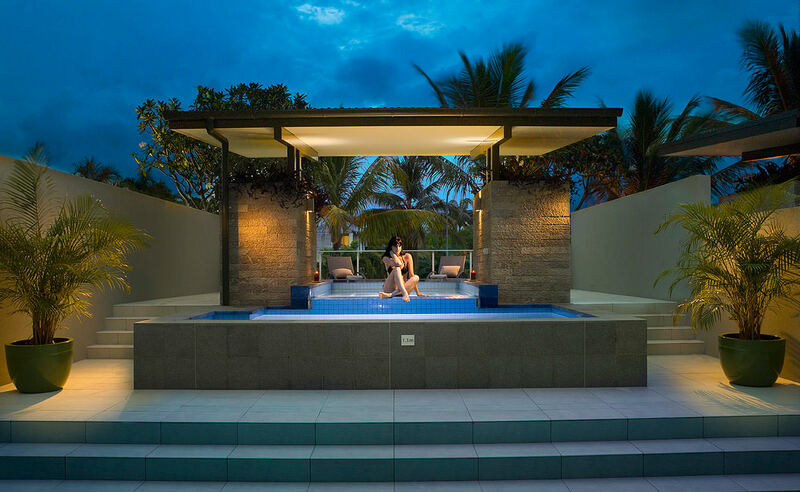 Private plunge pool and spa upstairs complete with covered BBQ, fridge and preparation area. Location is central to Port Douglas, beach and marina. We stayed in the 3 bedroom penthouse apartment. The apartment was fantastic - great location in Port Douglas, very close to the beach and shops and restaurants. Very clean and luxurious, good service would definitely recommend and stay there again. Thankyou coconut grove! By far this accomodation made our stay so much more enjoyable! We were able to cook bbqs by our private pool, as it comes in handy as dining out can get very expensive in Port Douglas. Clean, clean and clean! We’ve stayed at quite a few holiday apartments and this tops them all. It is beautifully decorated, central and very easy to get to. The main bathroom with the biggest bath tub I’ve ever been in was divine. Overall, one just feels at home, at ease and very relaxed. We shall return!